A 23-man contingent of the Black Stars left Accra on Monday aboard South Africa airlines for a training tour of Mozambique. The contingent is largely made up of players who featured in the Stars match against Bafana Bafana of South Africa in the World Cup qualifier in Kumasi on Sunday. They are expected to participate in some friendly games in their preparations towards their next qualifying match against their Ugandan counterparts billed for Kampala on July 4. 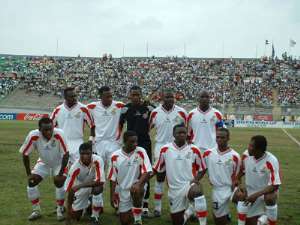 The Stars will play as guest of the Mozambique national team in a special Independence anniversary celebration match on Friday. Coach Mariano Barreto's team made up of 14 foreign based players and nine of their local counterparts will also engage in other friendly games before the Kampala crucial tie. Hearts of Oaks skipper Amankwaah Mireku, Sammy Adjei, Dan Quaye and Daniel Coleman are among the nine local players. The rest include Hamza Mohammed and Abubakar Yahuza from King Faisal whilst Charles Taylor, George Owu and William Tiero are from Kumasi Asante Kotoko. Skipper Stephen Appiah, Sule Muntari, Baffour Gyan, Emmanuel Duah, Emmanuel Osei, Addoquaye Pappoe and Ibrahim Tanko are among the foreign-based players. The rest are John Painstil, John Mensah, Kwadwo Poku, Kofi Amponsah, Lawrence Aidoo, Michael Essien, Samuel Osei Kuffour and Richard Kingston. The Stars who recorded a jink breaking 3-0 victory over the Bafana Bafana of South Africa are grouped together with Cape Verde, Uganda, Burkina Faso, South Africa and DR Congo who all presently have three points each but with goal difference.